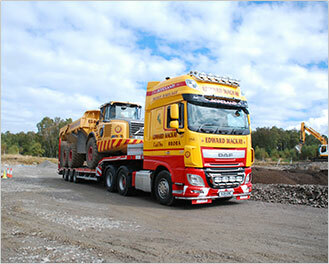 First established in 1958 as a road haulage company, Edward Mackay Contractor has progressed into all aspects of construction and civil engineering. Since then we have grown steadily and diversified to meet the needs and requirements of a large and varied client base. Operating from our bases in Brora and Beauly, we are perfectly placed to enhance our reputation for strong management, safe construction, quality and timely delivery of projects within budget. 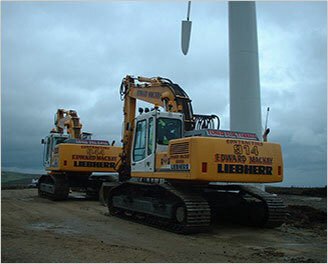 The company operates a fleet of excavators; provided by Liebherr & Volvo, with Volvo also being the ADT of choice, and is run by three generations of the Mackay family. Edward, the company founder is still actively involved in the day to day running of the company and is supported by his son and two grandsons in managing the different divisions. We are committed to providing a fully trained, efficient and adaptable workforce; this is achieved and delivered through our own Construction Skills Approved Trainer who has implemented a rotational training programme for all employees. All level of staff are encouraged to integrate freely with senior management to promote a close working environment which leads to excellent communication and understanding of policies. The rewards to both employer and employee are readily identifiable due to this view of a multi-skilled workforce coupled with the amassed experience of long serving employees. In light of the Scottish government’s policy on renewable energy, the company was motivated to become one of Scotland s leading specialist windfarm contractors, utilising our unique equipment, techniques and expertise. It was in 1996 that Edward Mackay Contractor Ltd undertook the infrastructure works for the Highlands first windfarm at Novar, Evanton. This project was successfully completed with a pronounced emphasis on environmentally friendly techniques and has since become the model on which all following windfarms in Scotland are based, by SNH amongst others. 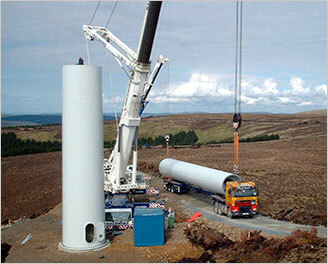 Since then we have continued to be successful in the delivery of windfarm projects throughout Scotland. In recent years the company has been heavily involved in the successful delivery of the Beauly –Denny Transmission Line Project, one of the largest overhead line projects in Europe stretching over 220km and including over 600 new towers. Working closely with the Principal contractor and the client we have assisted in a wide range of applications across the entire length of the project. The development and management of 9 on site quarry “borrow pits” processing over 200000 m3 of material. The preparation of 61 “rock anchor “sites. Construction of over 400 crane access pads. 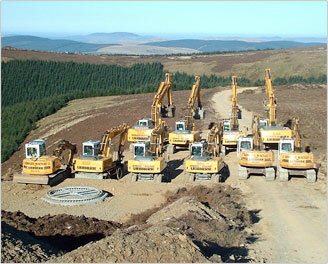 We are currently engaged in the reinstatement of these works, in some of the most extreme locations of the highlands. During the Beauly- Denny project we were extremely pleased to receive the “Managing Directors Sub-Contractor of Excellence Award” from principal contractor Balfour Beatty. This is awarded annually to “sub contractors who lead in promoting and implementing excellence in health and safety and being a visible role model for others to follow on a Balfour Beatty contract”. “One of the most challenging areas for access on the Beauly-Denny project is the section of line along the pass of Drumochter, an area with many environmental challenges and some of the steepest terrain on the project. The project team were keen to eliminate some of the additional risks associated with remote access by constructing a suitable stone road in an area that many people had advised it was impossible. Edward Mackay’s engineers and foremen were able to propose a number of different access options and then complete the agreed accesses in time for Balfour Beatty to come on to site during the summer months and construct the most challenging foundations on the entire project. The Edward Mackay engineers and supervisors went the extra mile and proactively identified areas where additional fencing was required to protect the A9 from possible debris falling from the access during construction and use. This was a great achievement for the company and is significantly important as we were chosen not only from contractors involved on the project but from across all sub-contractors currently working in the whole of the UK and Ireland. It is fair to say that over the last 57 years we have built a solid reputation and are recognised as one of the leading Earthworks and Civil Engineering companies in the north of Scotland. All images © Edward Mackay 2019.